1. Why did you choose to commit to this college? 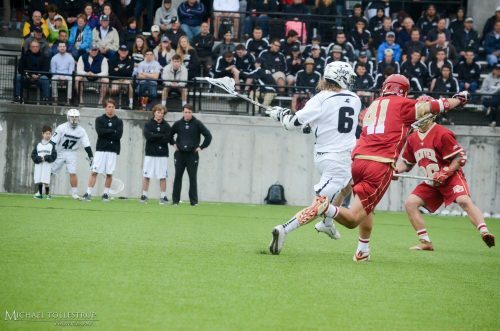 I chose Providence because of my coach and the school’s commitment to the lacrosse program. 2. What’s one piece of advice you’d give to someone younger than you, going through the same process? I would tell kids going through the recruiting process to try and find a coach they would love to play for. Coach Gabrielli has had so much confidence in me since day 1. It allowed me to get comfortable right away in the system and to get better as a player. When you know your coach has your back, it makes you want to do everything you possibly can to win because his job depends on it. 3. What was your favorite part about playing for the FLG lacrosse program? Playing for FLG created some of the best memories I have as a lacrosse player. I will always consider my FLG teammates my friends. We were such a tight-knit group that played as a team regardless of how many coaches were on the sideline watching our games. We went to battle against tough opponents many times together, and that really molded me as a player. 4. What peaks your interest outside of school and lacrosse? Meeting more and more people over time. I have became really good friends with friends of friends and it’s cool to know people all over the country. 5. If you were stranded on a deserted island and you can only have one thing, what would it be (you have food and water)? 6. If you had to choose one super power to have, what would it be and why? The ability to fly. I would be able to travel the world with no expenses. 7. What are some of your pregame rituals and/or game day superstitions? Before games, I usually talk with teammates in the locker room about something other than lacrosse. It helps clear out nervousness. Then i will listen to irish music and some bag pipes while looking at the field. It makes me remember all I went through to get to this point and fires me up. Lastly, as we get geared up, I imagine plays happening on the field to try and prepare myself one last time. 8. What is your favorite surface to play on? Turf or grass? 9. What is your favorite breakfast meal? 10. What athlete do you idolize the most? 11. What is your favorite genre of music? 13. Who you look up to the most in life? 14. where do you see yourself after college?